1. In the last stage of your daily skincare routine, use powder puff gently apply onto entire face or sebum concentrated areas. 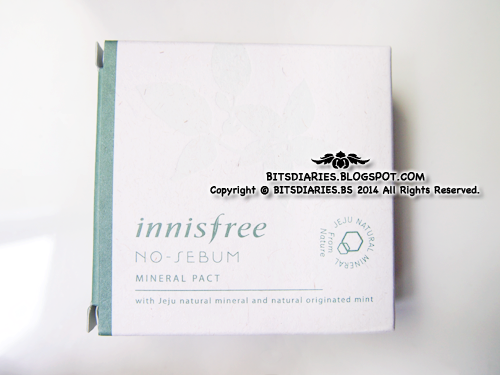 Innisfree No-Sebum Mineral Pact is packed in a box made of recycled materials. 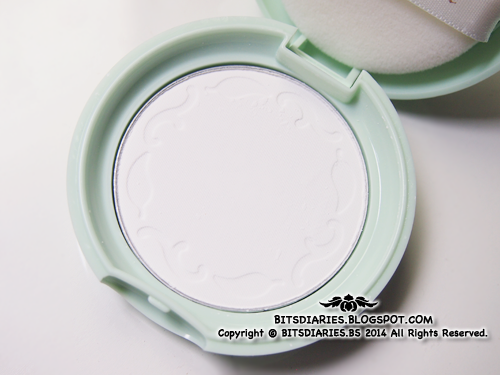 The pact itself comes in a very pretty matte mint green colored round case with a snap-on lid/case. The pact comes with a powder puff, which I don't really use. I prefer to use a powder brush instead. Between the powder puff and the powder itself, there is a plastic protective cover to protect the powder and at the same time, to allow the powder puff to 'sit on' without getting contact with the powder. The powder has some design prints being stamped/crafted on it's edge. With proper blending, it does not leave a white cast. It is a white translucent powder but no worries... As I've said before, with proper blending, it does not leave a white cast. 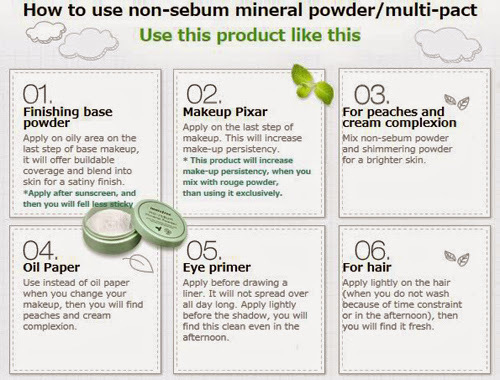 Also, the powder is very fine so it does not cake up unless your skin is dry or you apply too much. Just bear in mind not to use too much. A light coat will be sufficient. Very faint, mild minty scent. In my opinion, pretty excellent! Instantly leaves the skin shine-free right after application. 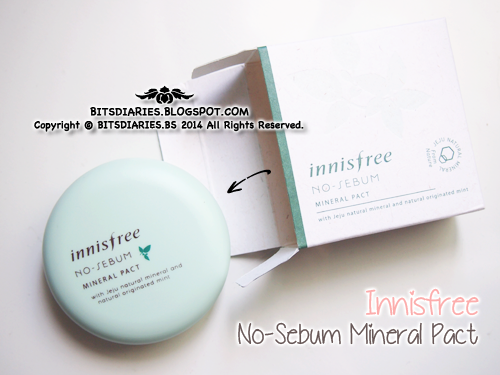 Verdict: In my opinion, Innisfree No-Sebum Mineral Pact does not have excellent oil control for me. My skin, especially my nose area, become oily right after 1.5 to 2 hours and I do need to touch up. But if I'm in an air-conditioned room or during cold/cooling, raining days, then I do not have to touch up that quick. I only need to touch up every 3+ hours. Hence, I think the oil control function is average. Well, I guess how good the oil control function depends on individual's skin oil production. One factor to take into consideration is the weather and temperature .aka. climate. As you (probably) know, I live in ultra hot and humid country so my skin gets oily super easily and fast. Thus, in my view, the oil control effect may vary individually depending on the climate you live in. On the positive side, it does have excellent sebum absorbing power! I like how fast it helps to absorb sebum right after application. It's like instantly leaving my skin shine-free and matte-looking. This has somewhat similar function like an oil-blotting sheet just that this is in a powder form which gives you a matte-look. By the way, if you care more about coverage, then this might not suit you as this has pretty low-coverage. 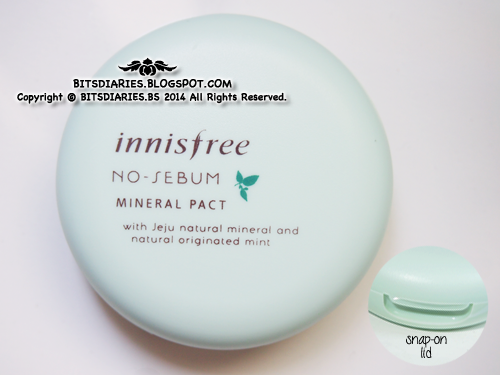 The Innisfree No-Sebum comes in pact form and also in loose powder form. Apparently, I got the pact one because I really hate using loose powder as it tends to get messy easily. I think pact will be much more at ease to bring around without needing to worry about spillage. Anyway, both loose powder and pact are travel-friendly. They are small in size and lightweight, in short, portable which is very convenient to carry them around in your purse/bag. 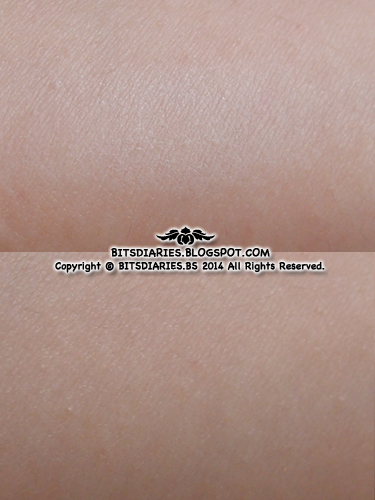 Check out my review on Innisfree No-Sebum BLUR PACT. 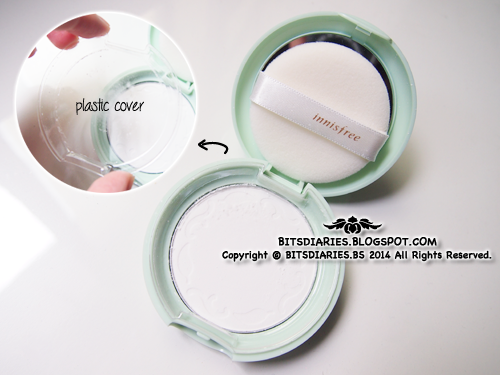 Sounds like a really good powder, I was hoping it would be better at controlling oil though :( Thanks for the review!! I want it try :) Great post. Aww wanted to try this out long ago, thanks for the review! 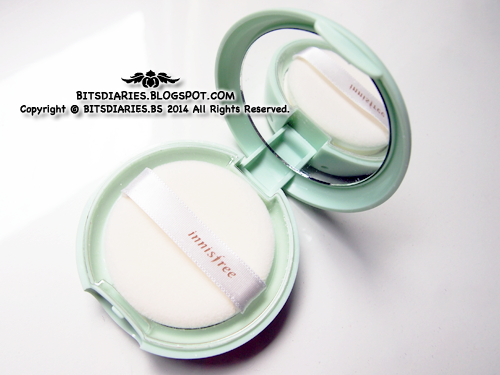 haha I absolutely love this product by Innisfree!